The provincial government of British Columbia describes Desolation Sound Marine Provincial Park as a “yachter’s paradise” located at the confluence of the Malaspina Inlet and Homfray Channel just north of the town of Power River. 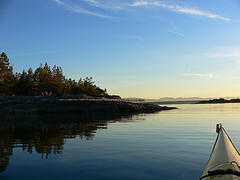 The calm, warm waters of Desolation Sound are a popular destination for boating tourists, swimmers, and scuba divers. Most visitors to this marine provincial park, however, are largely unaware of the interconnections between this park and the province’s history of colonization and the displacement of the region’s Aboriginal population.